Open the phone app "Camera Remote Watch" and adjust the camera view. On your watch: tap the Camera button to trigger the camera shutter on your phone. The photo will be stored in your phone photo gallery and you can access it with the iOS "Photos" app or the Android "Gallery" app. A copy of the photo will be shown on your watch, so that you can check if it looks good or if you should take another picture. Please make sure that the watch and the phone are connected before starting to take pictures. Be patient when downloading the new photo. 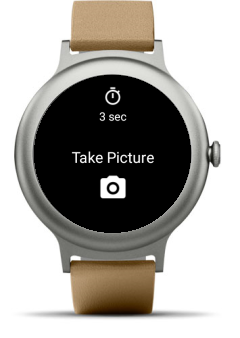 If the watch display goes black during the download of the photo, just tap the watch screen to switch the display on again. 1.) On your phone: configure the phone Display Settings to make sure that the phone screen does not switch off during the time you are taking pictures (you can't take pictures behind the phone Lock Screen). 2.) On your watch: close the app "Camera Remote Watch" and keep it closed until watch and phone are connetced. 3.) On your phone: open the Smartwatch Companion app and make sure that the watch and the phone are connected. 4.) On your phone: open the app "Camera Remote Watch" and adjust the camera view. 5.) On your watch: open the app "Camera Remote Watch" and tap the Camera button to trigger the camera shutter. Wait until the new picture is shown on your watch. If the watch display goes black during the download of the photo, just tap the watch screen to switch the display on again. 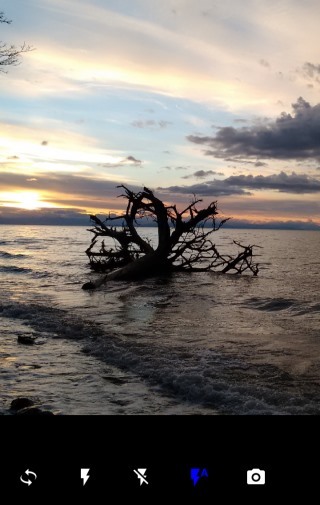 Please be patient when you download the new photo on your Fitbit watch, the Fitbit connectivity is slow and unreliable . The Fitbit "Sync" step, shown in the video, is very important. Don't skip it and make sure that the watch app "Camera Remote Watch" is closed during the Sync.